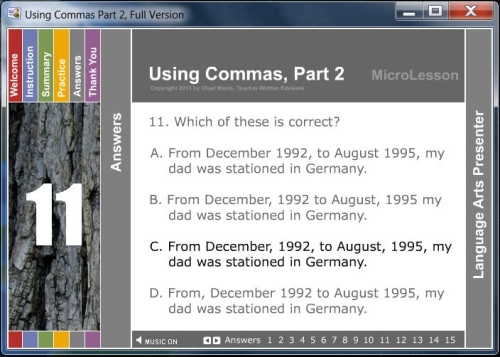 Using Commas, Part 2 is one of the 30 MicroLessons (mini lessons) available in the series, Language Arts Presenter. 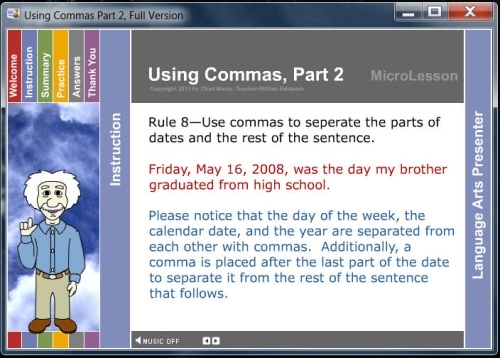 Just connect your computer to a digital projector or SMART Board, select a student to operate the mouse and let Al, the avatar, teach your kids a lesson on Using Commas, Part 2. 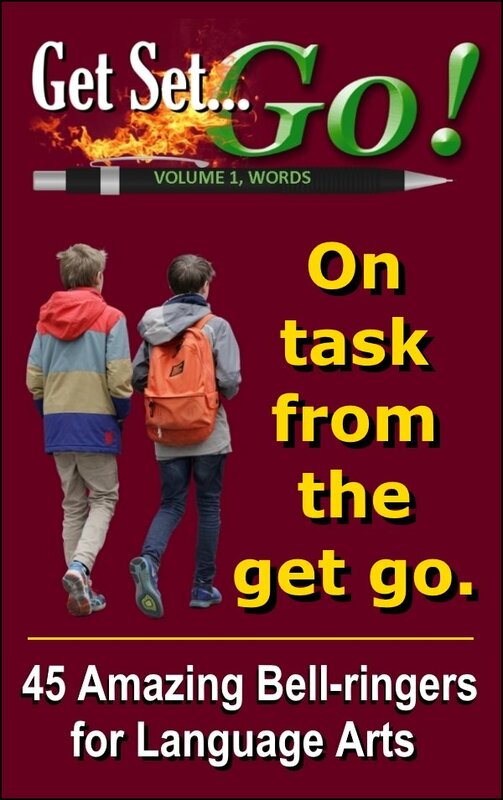 This MicroLesson (like all of the others in the series) comes with a word search activity and a crossword puzzle based entirely on the presentation--the words found in the word search provide the word bank for the crossword puzzle. Therefore, this presentation along with the time required to complete both puzzles will require 50-60 classroom minutes. You may use the following quick links to go directly to what interests you on this page. You may also scroll down the page manually if you choose to do so. set off the explanatory words of a direct quotation. separate the parts of dates and addresses from the rest of the sentence. connect the two parts of a compound sentence joined with a conjunction. follow the greeting and closing of an e-mail or friendly letter. separate large numbers into groups of three placeholders. 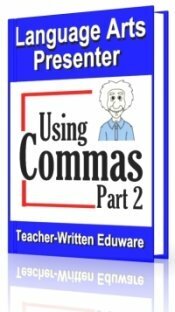 In addition, students will recognize correct comma usage in 15 sample sentences. Using Commas, Part 2, Full Version comes with a word search, and a crossword puzzle. I have thoroughly tested this MicroLesson with actual students in real-life, public, middle school classrooms--the vast majority of students became engaged, responsive, and productive (even the Ne'r-Do-Wells). Both of the screenshots below are samples from the instruction portion of Using Commas, Part 2. Here is the word search activity for Using Commas, Part 2.
a summary of the instruction. practice quizzes ranging from 5 to 15 questions. 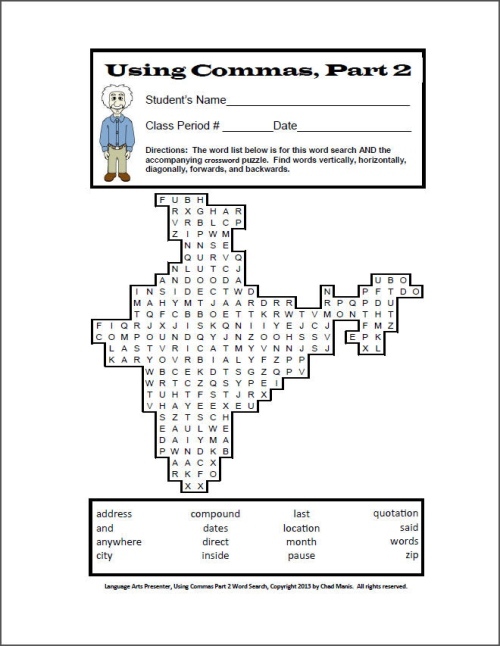 a word search and crossword puzzle to extend the mini lesson. appoint students to be mouse operators while they roam the classroom, keeping a wary eye on the knuckleheads. become dynamic partners with the avatars, giving additional examples of concepts, checking for comprehension, and reading questions and answer choices orally to the class. record scores, grade papers, or even work on lesson plans. All of the titles in the Language Arts Presenter series are accessible with any of the major web browsers, including Internet Explorer, Firefox, Google Chrome, and Safari. As a result, these apps are compatible with all versions of both Windows and Mac. available for an unlimited time trial. The "Free Trial Version" stamps are a necessary annoyance. When you consider the fact that I spent two and a half years of my life developing these MicroLessons, I would sincerely hope that you would agree that giving them away completely free of charge is not a plausible option. is exactly the same as the free version. is completely devoid of all "Free Trial Version" stamps. comes with a word search and a crossword puzzle. 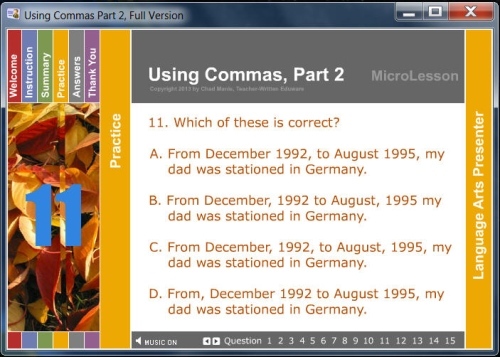 Both versions of Using Commas, Part 2 are accessible with any of the major web browsers, including Internet Explorer, Firefox, Google Chrome, and Safari. As a result, these apps are compatible with all versions of both Windows and Mac. NOW ON SALE: 50% OFF! 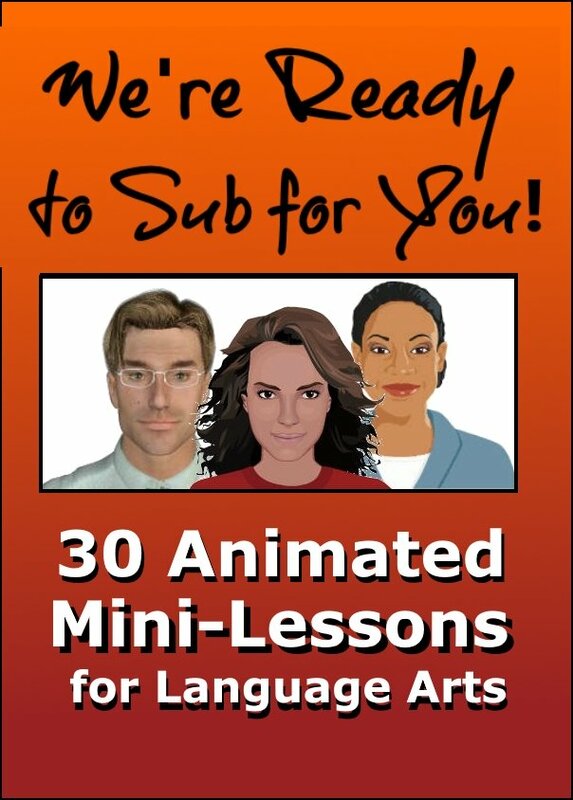 The Mechanics Bundle contains all eight Mechanics MicroLessons from the Language Arts Presenter series. If purchased individually, the total cost for Using Commas, Part 2 along with its 7 companions would be $34.65. The bundle is now available for the much lower cost of $19.75--a savings of over 50%! 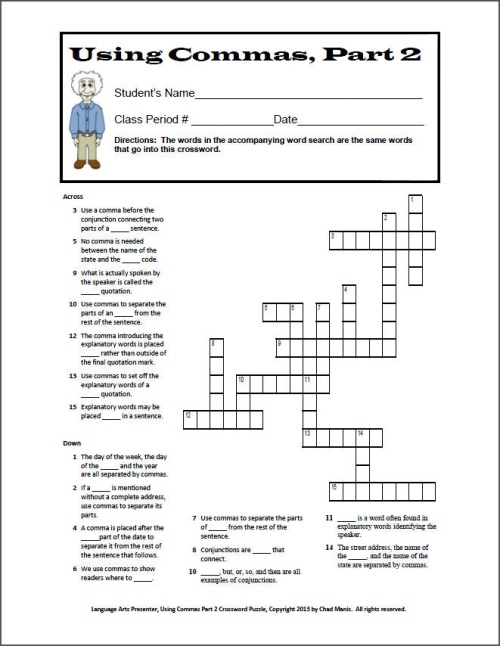 The Mechanics Bundle comes with a word search and a crossword puzzle for each MicroLesson. 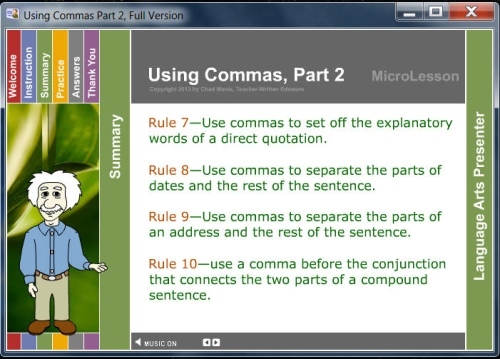 MicroLesson 18: Using Commas, Part 2, Full Version by Chad Manis is licensed under a Creative Commons Attribution-NonCommercial-NoDerivs 3.0 Unported License.